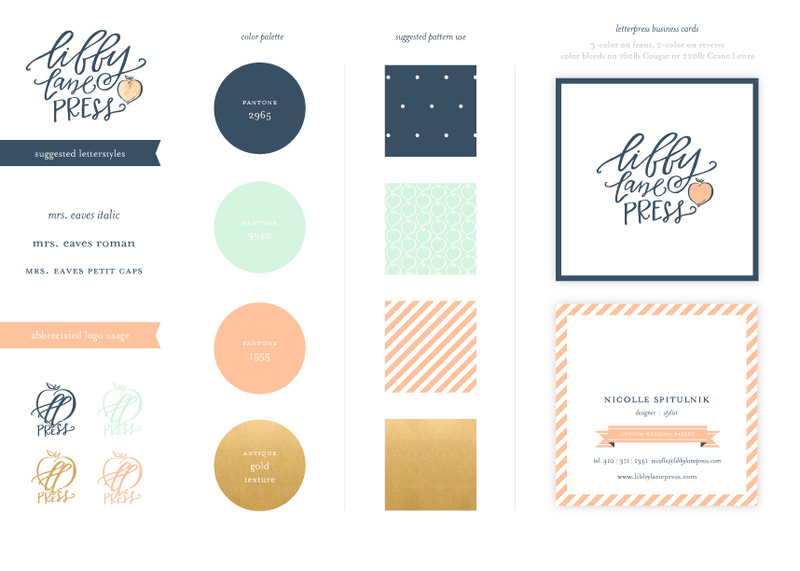 I had the pleasure of meeting Nicolle at Stationery Academy earlier this year and I was thrilled to meet her, become friends with her and watch her new brand come to life. Nicolle’s business focused on party paper and styling, but she yearned for the business of custom weddings. We felt Libby Lane Press needed a more polished look in the effort to appeal to brides seeking custom wedding papers. Nicolle commissioned the talented Lindsay Letters to hand render a beautiful logo for the new look of Libby Lane Press. We took the logo and further defined her color palette, custom patterns, letter style recommendations and logo abbreviations. Below is the before and after so you can see the transformation – we are thrilled with the results and are pins and needles waiting to see the new website!